Bryant Park is one of my favourite outdoor spaces in NYC, and has the added benefit of being just a couple of blocks away from Tom’s office. Throughout the summer its lawn has been the venue for a range of concerts and movies, as well as other activities such as yoga and tai chi. 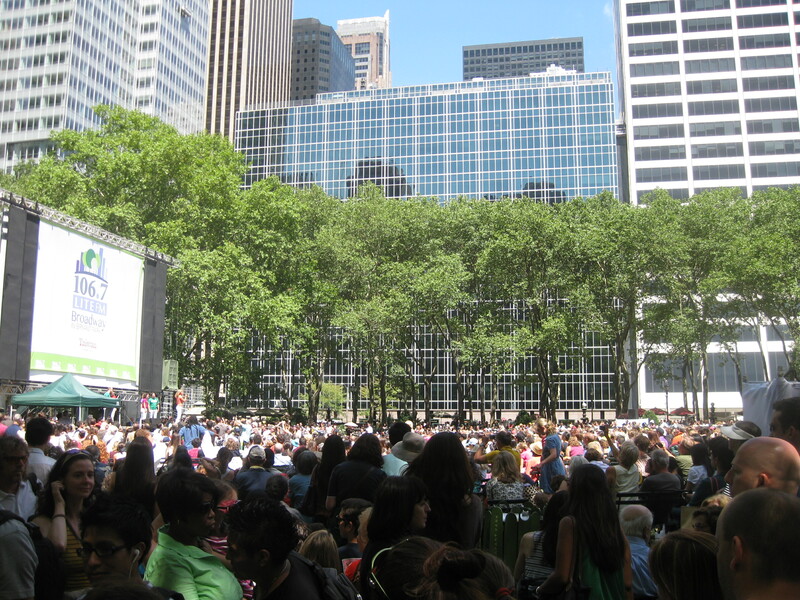 We took a picnic lunch along one Thursday to see the last in the series of Broadway on Bryant Park concerts, arriving way too late to get a good spot. Cast members performed numbers from Mamma Mia, Motown the Musical, and a couple of other shows, and it was all most enjoyable. 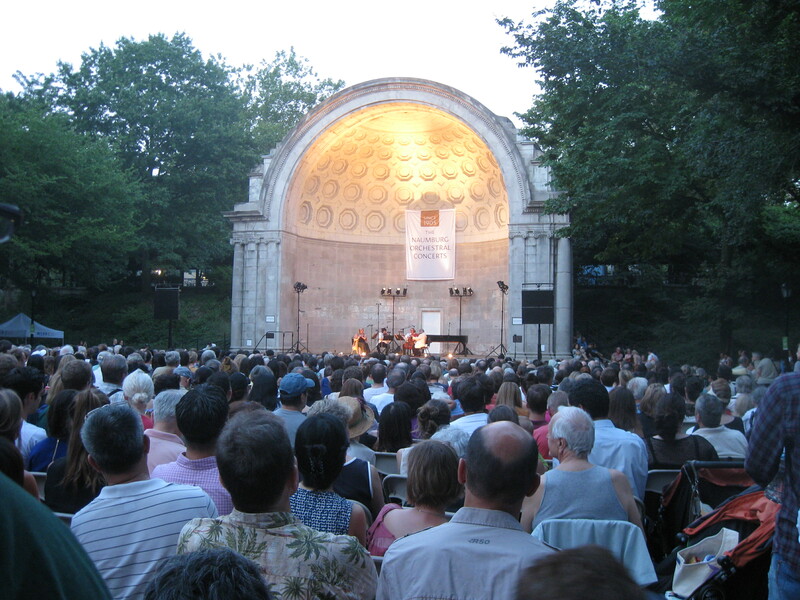 A few evenings later (whilst Tom was enjoying corporate hospitality in a rooftop venue overlooking Bryant Park) I took myself off to a concert in Central Park’s Naumberg Bandshell. Dating from 1923, the bandshell hosts an annual concert series which actually began in 1905, and it’s a rather more impressive edifice than your average bandstand! 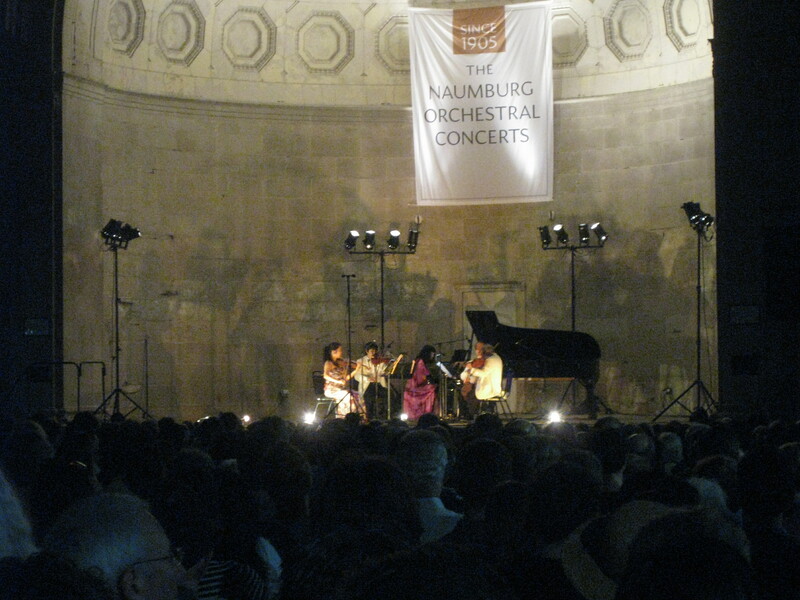 I joined an audience of well over 1000 people to hear the Chamber Music Society of Lincoln Center present a programme of chamber music by Mozart, Beethoven and Dvorak. Whilst not perhaps the most obvious choice for an open air recital, a little amplification ensured that the sound carried beautifully, only disturbed by a couple of helicopters and other light aircraft, and the occasional bat. I was impressed to discover that a couple of the musicians were playing from iPads instead of sheet music in case of inconvenient breezes (they turn the pages by means of a wireless foot pedal), and particularly taken by the dramatic shadows cast against the back wall. 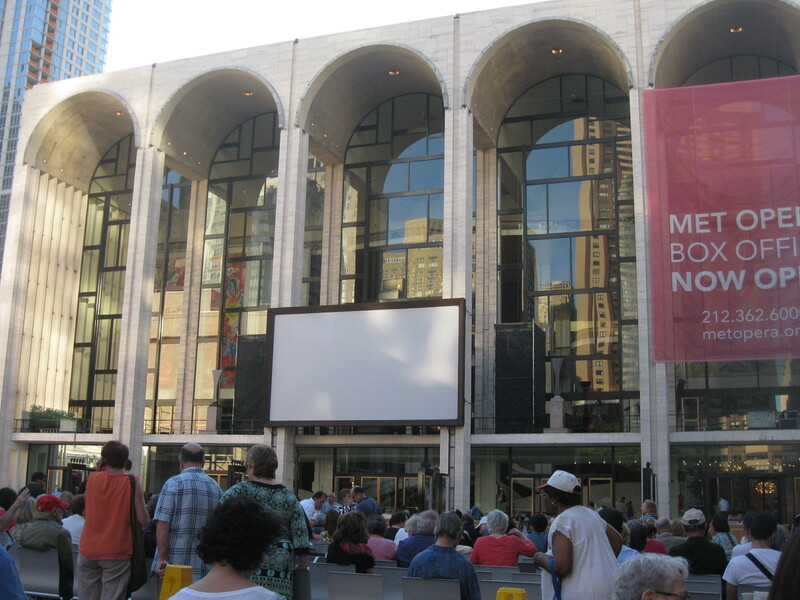 Our most recent excursion was to a screening of La Traviata, the first in this year’s Met Opera Summer HD Festival. Many of their productions are recorded for broadcast, and they show a selection at the end of each summer on a big screen in the plaza outside the opera house. Once again I’d estimate that the audience numbered over 1000, but this time we arrived in time to grab a decent seat (and were certainly much closer to the action than we can usually afford at the opera!). Beautifully recorded and with excellent sound it was almost as good as attending the opera ‘for real’, although it felt a little strange to join in the applause. We really have been very lucky – only a couple of the events we planned to attend this summer have been cancelled because of the weather, and we’ve managed to see a decent range of productions, all of which were well worth attending. Now it’s all nearly over I can’t help regretting that we didn’t make more effort and so missed masses of equally great stuff – next year we’ll have to try harder and see more! This entry was posted in Living and tagged concerts, outdoors by Emma Davidson. Bookmark the permalink.